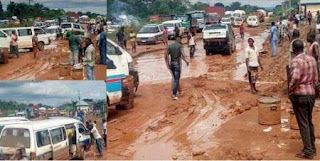 IN what appeared to be a self assesment, the Federal Government, yesterday, scored itself and came to a conclusion that the worst roads in the country were located in the South-South and South-East geopolitical zones. Disclosing this, yesterday, in Abuja when he appeared before the Senate Committee on Federal Roads Maintenance Agency, FERMA, headed by Senator Magnus Abe, Minister of Power, Works and Housing, Babatunde Fashola, who noted that some of the major federal roads in the 11 states were constructed before the 1967-1970 Nigerian Civil War, said that efforts were being put in place to fix the roads. Fashola told the senators that the N100 billion sourced through the Sukuk bond, was yet to be released to his Ministry to carry out 25 major road construction projects in the six geopolitical zones of the country. Chairman of FERMA committee, Senator Abe, noted that senators who are the true representatives of the people were usually sidelined by heads of Ministries, Departments and Agencies of the Federal Government when mulling siting of projects. On his part, Fashola said: “When we did the audit of our roads, we discovered that some sections are bad. Many roads have outlived their lifespans. Many roads in the South-East and South South were built before the civil war. They are among the worst in the country. They need to be replaced. “Funds generated from Sukuk have not been released because of the conditions tied to them. We will try and repair the roads before people start travelling for the festivities in December. We are doing something about that.” On the Challenges facing FERMA, Fashola said: “One of the reccurring stories of under performance which we inherited is that of ministerial interference. We have tried to supervise without interfering. As best as possible, we try not to. “I have tried to enable government see what it is spending in each of the parastatals under my ministry. In the past, FERMA spent money on areas it had no business with. 0 Response to "FG Admits, Says S-East, S-South Worst Roads In The Country"